SINGAPORE'S open economy and timely data releases usually make it a barometer for Asia's economic health, but now the beacon is pointing in a different direction from some of its neighbours. While the region is marked by slower growth, sentiment here has received a shot in the arm. Gross domestic product grew an unexpected 3.8 per cent in the three months to June 30, trumping the advance estimate of 3.7 per cent, data on Monday showed. The growth forecast for the full year has also been raised - from between 1 and 3 per cent to between 2.5 and 3.5 per cent. In comparison, GDP growth in Indonesia slowed to 5.8 per cent in the quarter, down from 6 per cent in the first three months. Thailand's GDP forecast has also been revised to 4.2 per cent for the full year, down from 5.1 per cent. A key differentiator has been manufacturing, which picked up in Singapore over the last few months while slipping in the rest of the region. Singapore's purchasing managers' index (PMI) - a gauge of factory activity - has risen for four straight months, climbing from 50.6 in March to 51.8 last month and bucking a trend of falling factory activity in the rest of the region. The PMI for Indonesia, for example, dipped in three of the last four months, falling from 51.3 in March to 50.7 last month. PMIs have also declined in India, South Korea and Taiwan, among other Asian countries. 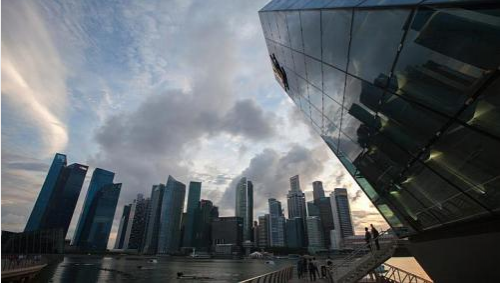 Economists say the reasons behind Singapore's regional outperformance stem from the Republic's strengths in specific sectors and its freedom from certain weaknesses in other parts of Asia. For one thing, Singapore's position as a trade and financial services hub gives it an edge. The finance and insurance sector led the expansion in services in the second quarter, growing 13.1 per cent over a year ago, while services such as wholesale and retail trade and transport and storage also boomed. Singapore is also more sensitive to fluctuations in global demand than its neighbours, said Barclays economist Leong Wai Ho. The pick-up in growth momentum in the United States was a key driver behind Singapore's relative strength in the second quarter - a trend likely to continue in this half, added Mr Leong. "External demand is a larger share of GDP for Singapore than for most of our neighbours, and the lift should come slightly sooner for Singapore if the global recovery continues," he said. CIMB economist Song Seng Wun agreed, adding that the unexpected uptick in second quarter GDP growth might reflect early signs that global economic sentiment is improving. Meanwhile, Bank of America Merrill Lynch economist Chua Hak Bin said Singapore's relative strength is due partly to the fact that it is not as dependent on commodity exports as Indonesia, Malaysia and Thailand. All have seen exports drop sharply as commodity prices plunged this year. He added that Singapore's economy and financial markets are also less vulnerable to fears of capital outflows once the US winds down its stimulus policies because it received fewer inflows of money than neighbours such as Malaysia, Indonesia, Thailand and the Philippines. Worries over an end to the US quantitative easing policy and subsequent rising interest rates have recently hit regional stocks and currencies. But some economists warn that Singapore's outlook for the year is still far from certain. Mr Sanjay Mathur, head of ex-Japan Asia Pacific economic research at RBS, said it is still unclear whether Singapore's growth in the second quarter will turn out to be "an anomaly". "Global trade is still very weak and domestic demand in Singapore is slowing. The recovery in exports is still very tentative... It is still not clear whether this will be sustainable," he said, citing uncertainties over China's economic restructuring and growth prospects as reasons for caution.